Download and install Google Cloud SDK. The instructions for downloading and installing Google Cloud SDK can be found on Installing Cloud SDK page. Unzip or Untar the downloaded file and go to the google-cloud-sdk folder. Execute install.sh or install.bat appropriately from google cloud sdk folder based on the OS version for setting up Google Cloud SDK. Once done with installation, initialize GCloud SDK by executing the following command from google-cloud-sdk/bin folder. Login to Google Cloud Console. Create new Appengine project as shown in the screenshot given below. Click on + (plus) button to add new project. Another dialog box will open up as shown in the diagran given below. Give a project name and create the project. Executing following command would take you to the google website and ask you to authorize with one of the accounts. Choose account using which you access the Google Cloud Console. 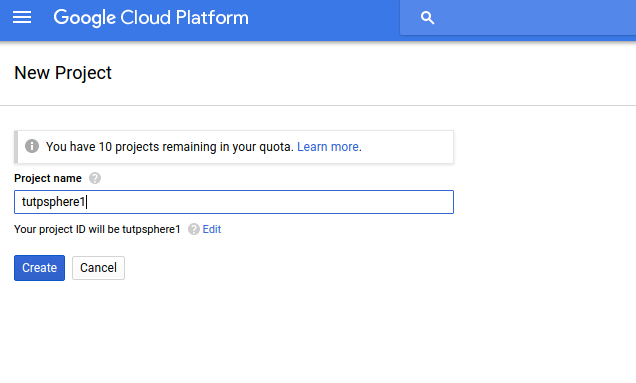 Login to Google Cloud Console, select appengine project and get the appengine project id (Project ID). The following screenshot represents project id, perfect-ray-167007. Execute following command with the copied project id and set the project. Command such as gcloud config set is used to set Cloud SDK property. In the command given below, Cloud SDK project property is set. Once done with above, you are all set to deploy your Java web app on Google Appengine. In an upcoming article, you will learn about how to deploy Spring boot web app on Google Appengine.